Avery 5160 Easy Peel White Address Labels are perfect for creating professional labels quickly and easily. 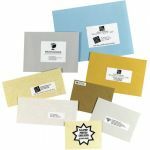 These mailing labels are ideal for bulk mailing and shipping projects, and for identifying and organizing personal belongings in your classroom, garage, home or office. 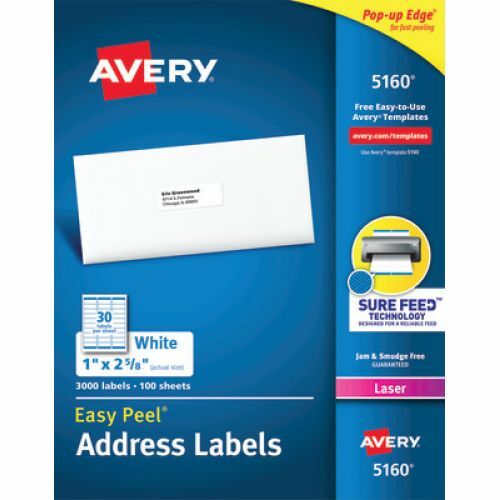 Only Avery address labels offer our Sure Feed feature that delivers a more reliable feed through your printer and prevents jams and misalignments. Each white label features Ultrahold permanent adhesive guaranteed to stick and stay on envelopes, cardboard, paper, glass or metal. The Easy Peel feature makes the mailing address labels easy to peel and quick to apply. Simply bend the label sheet to expose the Pop-up Edge, peel off your label and fold the sheet back to flat. Optimized for laser printers, you can produce crisp text and bold graphics on these address labels without worrying about smudges.